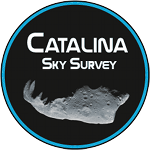 June 30th, Asteroid Day provides Catalina Sky Survey experts a world-wide stage to explain the science of discovering near-Earth asteroids. Spectacular Comet Johnson becomes a binocular object in May 2017! 2014 JO25 appears to be a contact binary asteroid, this from spectacular radar images acquired by NASA's Goldstone Deep Space Communications Complex in California. In another close flyby of Earth, 2017 EA passed 14,500 km (9000 miles) over the Pacific Ocean region on March 2, 2017, its path entering within the ring of orbiting man-made satellites.